I have heard people say that they take part in various extreme sports because of the thrill they get from the risk of injury (or worse). In the adrenaline soaked moment of the bungee jump/surfing a huge wave etc etc they feel most alive. I have also met several people of a more timid disposition. Totally risk averse. I would have myself falling between these two metaphorical stools. I am not about to take up sky diving or white water rafting but I do like the occasional frisson of risk in my life, a whiff of adrenaline rather than a rush. I will look over a huge cliff but I won't tie a rope to it and jump off. I suppose it is mild peril that is enough for me. On this occasion though a strong and gusty wind is whipping in from Liverpool Bay from a slightly south westerly direction. 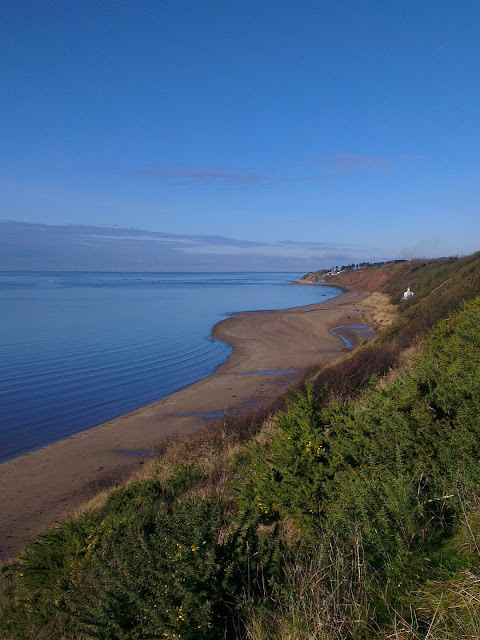 The turbulent air hits the boulder cley cliffs creating an updraft that makes the cliff top path at Thurstaston an mildly perilous place to be. It is here that I am perched being buffeted by the aforementioned winds on a rare sunny afternoon. 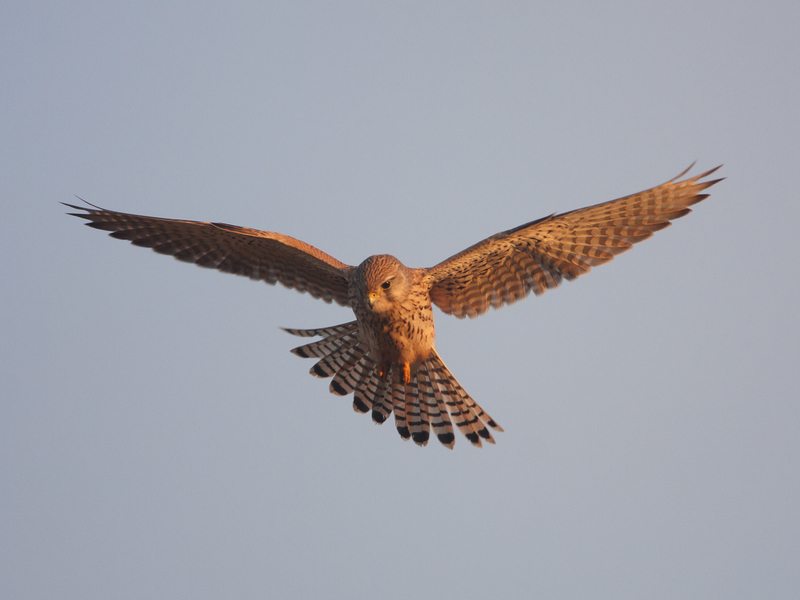 I am looking for Kestrels. 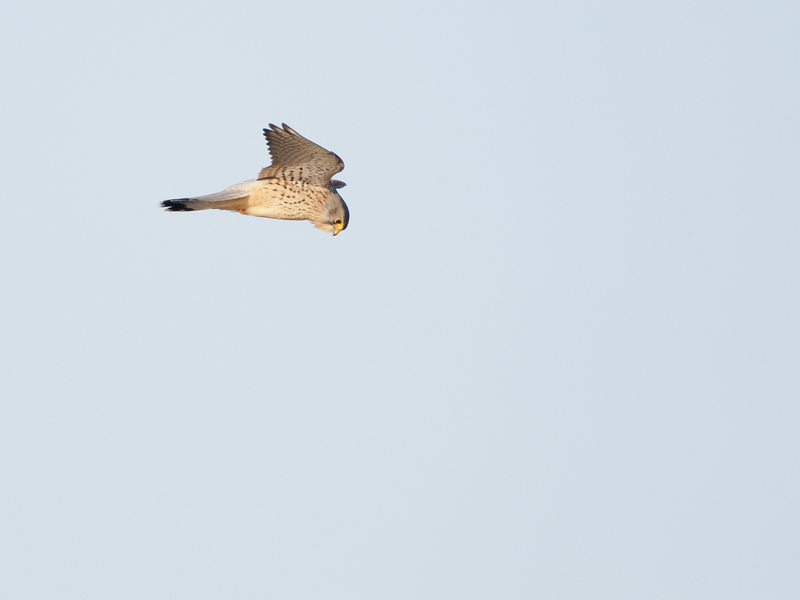 These birds use the updrafts to hang over the sloping cliffs and search for food on the cracked cley beneath. I don't have to wait for long until one arrives, way off to my left. 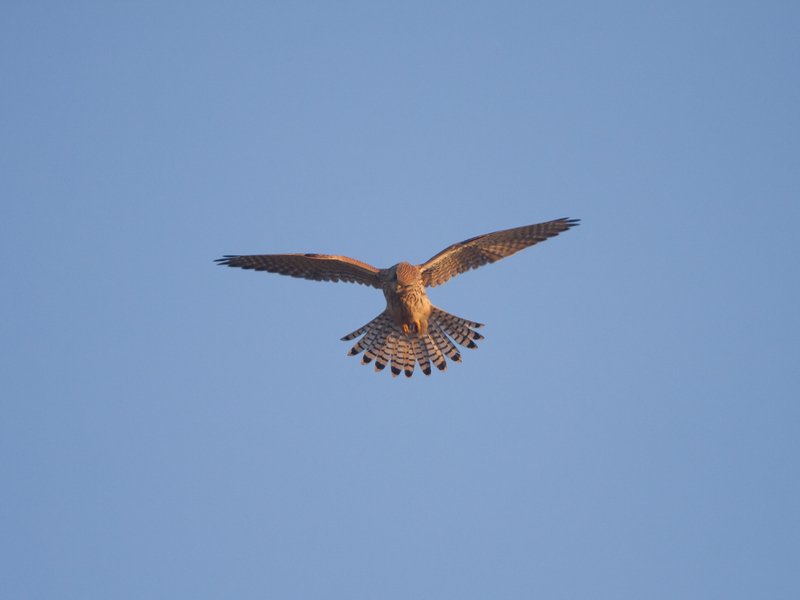 I zip off a few shots before the handsome male zips off towards Heswall Fields. I don't follow the cliff top there is on private land and trespassing is a little too perilous for me. A few minutes later a female come in, closer this time. The wind is getting stronger all the time, the gusts feel like slaps across my face. It is not easy to stand still on the exposed cliff top. The buffeting and the deafening white noise of the wind is quite disorientating. 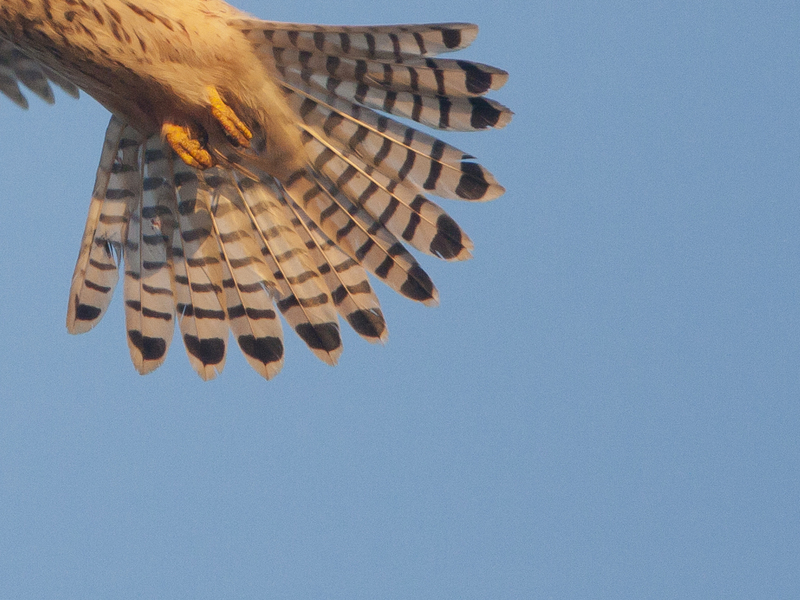 The Kestrel is showing no signs of struggling with the roiling air. It's head eyes remain fixed on a spot on the slope, wings, tail and body are adjusted to maintain focus on its prey. After a few minutes I am still there and the cliff hasn't given way, my confidence grows. I lean slightly into the wind, it takes some of my weight and I get a little whiff of adrenaline. A gust whooshes then dies and my lean nearly stalls into a fall. A spike of adrenaline, thats enough for me. Plus the kit wouldn't react to well to a tumble down the cliff. The Kestrel continues to ride the air currents without fear of wind or vertigo. I wander down to the beach and she is still hovering over the same stretch of cliff. I wander up to her and watch as she patrols up and down, up and down. All this looking up through the viewfinder is making my neck a little sore so I decide to lie down on the sand. As I get a few more pictures it occurrs to me a passer by might well interpret my prone position as the result of a head over heels trip down the cliff. However a glance up and down the shore reassures me that I am the only person on the shore. The wind blows sand into my ears, it stings my cheeks and gets into my hair. 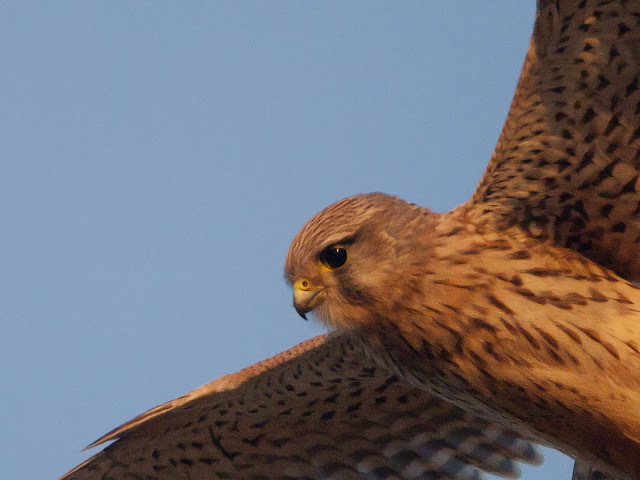 Still the Kestrel is unmoved, her tail makes minute adjustments to keep her steady through the gale.